Recently we were pottering happily along a pebbly beach on the island of Lismore, and some of the stones that we were picking up looked like this. Just one pebble with a hole in it you could probably accept as a happy stroke of luck – but there were many more! Some had just one hole, beautifully drilled and smooth on the inside, just wide enough to put your little finger in; others were perforated with a network of tiny tunnels, so that if you held one up you could see a thousand pinpoints of light. But how do these holes occur? They are certainly not caused by the sea. The culprit is a mollusc, and it is called a piddock. WHAT ON EARTH ARE PIDDOCKS? 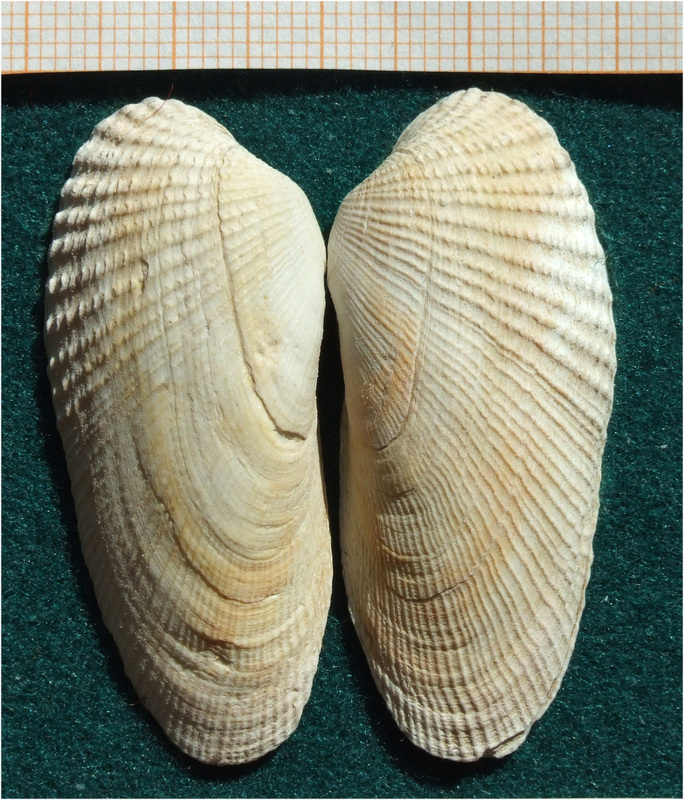 Piddocks are bivalves, and their specially-adapted oval shells are edged with fine teeth which they use to excavate burrows in rock. Their fleshy foot grips the stone surface and helps to rotate the shell, creating a circular scouring action. Piddocks will also drill into submerged wood, if it happens to be available. 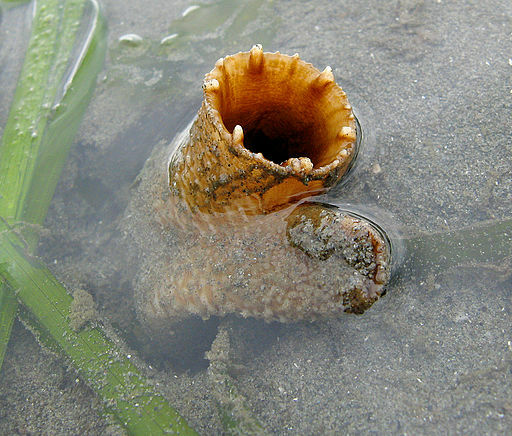 Several other species of mollusc, along with some worms and sponges, can also create holes in solid rock. These examples may have been carved by a number of different species. 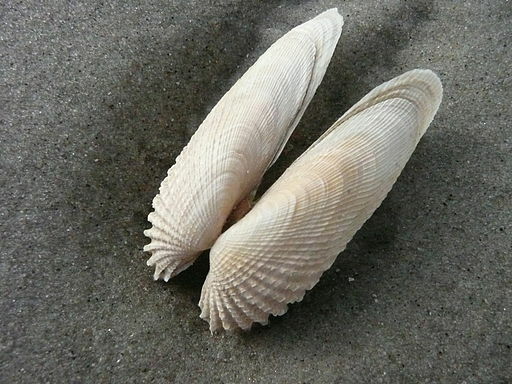 Piddocks are also known as Angelwings, which I think is a lovely name: you can immediately see why, when their shell is opened out. There are many species of piddocks, but the one that is native to British shores is the Common Piddock (Pholas dactylus). Surprisingly, it can grow to 15 cm in length. If this is true, what a huge role for a humble mollusc! Sadly, I can find no more information to back up the claim. But that doesn’t stop my imagination from conjuring an interesting scene, perhaps at a banquet or even on a windswept rocky shore where the knowledge of ‘magical’ creatures might have given a vital edge to an early contender for Scotland’s crown. I shall look at piddocks in a whole new light from now on! The wonderful thing about piddock art is that every piece is unique. I have several treasured examples – one with a shell still inside, which rattles when you shake it. If you tilt it, you can just see the tip of the piddock shell, but the burrow entrance is too narrow for it to drop out. 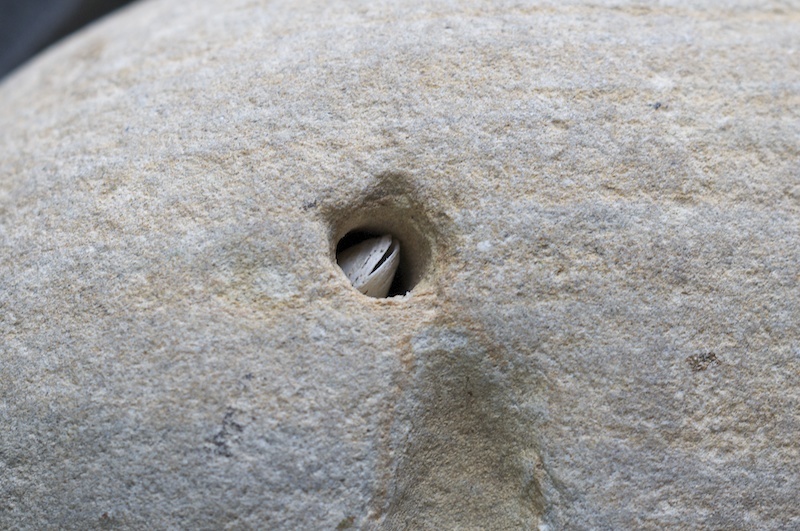 Piddocks aren’t the only molluscs capable of making holes in rock. Several others, along with worms and sponges, are described by Jessica Winder in this wonderful post on her Nature Blog, illustrated with some superb photos taken on beaches in the south of England. She also writes about piddocks, and has published some great photos of the creatures in action. Photos © copyright Colin & Jo Woolf unless otherwise stated. Thanks for this truly refreshing post… I’ll treasure that information every time I walk the beach. Thank you very much, I’m so glad to hear you enjoyed it! I am also lucky in that I have friends who have brought me stones and shells back from places I’ve never been – I have a few bits of lava from Iceland, some wonderful desert rose crystals and geodes from Algeria, and some jade from New Zealand. They are cherished too! Thanks for your comment and good luck with your rock hunting! There must be a fresh-water North American equivalent of this mollusk because I have picked up stones like this, riddled with smooth holes, in many places near water in the Midwest. Thank you for this interesting post! That’s an interesting thought! I don’t see any reason why there shouldn’t be freshwater piddocks too… wow, they’re everywhere!! 🙂 Thank you for your comment! They’re called Omar’s in Michigan. That’s interesting – I wonder where that comes from! That sounds very possible! Thank you for this. Altogether astonishing! When you mentioned shaking a stone with a shell still inside, it triggered a memory of me doing that with a stone I found on a beach once, but it’s just a vague memory. From now on I’m going to be paying attention to any stones with wee holes in them. Thank you for the lesson on piddocks! Aagh, now you’re going to be wondering where it was! I hope you find another! They are amazing little creatures, aren’t they?! I’m really glad you enjoyed finding out about them as much as I did! Thank you, glad you found it interesting! I couldn’t believe someone had a pet rock called Bashful, but I checked your site and there he was! Say hi to Bashful for me! (Just going to count my own pet rocks now!) 😀 Good to hear from you, Bacon! I will definitely say hi to the little fellow for you. Right now, he is currently in France visiting friends. I don’t know if you checked out some of my posts from last week but he was on there with some of his adventures in France. Absolutely enchanting!. It is lovely to see that even the humblest of creatures can create such a wonderful universe. The nursery is an endearing sight. Thank you for this informative article with great pictures. Now I”ll take a look at my rock collection!. Aren’t they lovely?! They do create their own universe, you’re right! I’m so glad you found it interesting. It’s really nice to meet other people who are just as passionate about rocks! So that’s what they are from! We always come home with rocks and shells when traveling. I’ve seen rocks with holes for years, but never thought to find out what created the holes. I thought it was just soft spots in the stone that were worn away. Fascinating!!! Wonderful, Jo! Love the “peeping piddock” especially and the bit about the first king of Scotland’s glowing mouth–Kenneth MacAlpin, wasn’t it? Marvelous. Scotland’s cuisine can sometimes have a sort of stunt-food factor to it, so this doesn’t sound too far fetched. Heh heh! Thank you, Hank! The whole ‘king of Scotland’ thing is mind-boggling. I’ll have to consult Neil Oliver about who was the first King of Scotland. I think he slightly disputes Kenneth MacAlpin’s claim! But then maybe he’s never heard of piddocks?! Oh! We love Neil Oliver! Love, love, love him! Especially that wee flip of his locks when he’s dashing off on a particularly interesting topic. Heh heh. What a great storyteller! He’s so good, isn’t he?! He gets really passionate about the subjects he’s talking about! I love his books too – he has a great way of writing. A real storyteller, you’re right! It’s well worth going, Scott! I’m sure you’d find some great subjects for photography. Keep an eye open for piddocks! Thank you! 😀 We found some good rocks that day, didn’t we! I’ve still got to find homes for some. Nice that you’ve started a collection too! I would never thought that a small mollusc could drill something like that! Incredible! No, I know, it’s amazing, isn’t it? Sounds like fun, Debbie. I have never been to Southsea but it sounds like a great place for piddocks! Thanks very much for your comment! http://www.teara.govt.nz/en/shellfish/page-4 We have similar boring wee critters drilling happily on our beaches too. I am off to consult my Native Animals of NZ book to learn more. Kids would love to have glowing mouths just as potential kings obviously did!!! Fascinating post Jo. Thank you…..and I love the word Piddock and the Angel Wings are simply beautiful. Wow, so you have piddocks in NZ too! Thank you for the page link – I love the reference to shipworms and their damage to the ‘bridge over troubled waters’! Since writing this post I’m hearing of piddocks all over the world, (well maybe a slight exaggeration!) which is lovely! Thanks for this, Lyn. What great photos! And your collection looks so familiar, just like an Oregon beach. I loved the “peeping piddock.” Goodness, we’ve learned a lot this week! Fascinating. Much more so than anything on the course I’m doing at the moment (Understanding our Oceans, Southampton University). Thanks for the links, too. I have a few pieces of ‘piddock-art’ myself, but had never thought to investigate what a piddock looks like – beautiful, I love the ‘angelwing’ name and amazing that something so fragile can bore through rock. Where can i send you photos of my find? You’re most welcome, and I’m very glad you found some holey stones! 🙂 Once you’ve found one, you’ll be finding lots more (or that’s what happened for me). Thanks for following my blog! I hope you’ll find lots more of interest. Thank you for your slant on this, Steve. Actually I can find a lot of whole shell of the creature. I’ve also found one alive. It was on a sand bar so I placed it back in a tide pool. I never knew what they where until now. I’m glad that you’ve found some whole shells, and interesting to know that you have found a live piddock. Thanks for your comment. What wonderful finds! Real treasures. Thanks for telling me about them. What a great article – I have learned so much and am thrilled to know what those fabulously perfect holes are in stones and how they were made. My granddaughter will be delighted to know too. Thank you so much. Amazing! I live in southeastern Oregon, and have found many rocks with holes in them. Would I be correct in assuming that the high desert area I live in was once under water and a home for Piddocks? I’ll bet you’re right. There was a LOT of volcanic activity here. Awesome, amazing and wonderous!!! Thanks for sharing. Wonderful! So many of my rocks make a lot more sense, now! I really enjoyed this informative article! I hope you don’t mind but I have linked to your blog in a post on FB and Twitter. I have three stones with holes made by Piddocks that I use on my stand when promoting The Wildlife Trust. They attract an enormous amount of interest and I found your blog when researching them. Thanks for putting such fascinating information on line. Most welcome, and thank you for sharing it! 🙂 People seem to love finding out about them – and there’s something really pleasing about piddock ‘artwork’! Well done for spreading the word! Reblogged this on The Witch Hecataine. 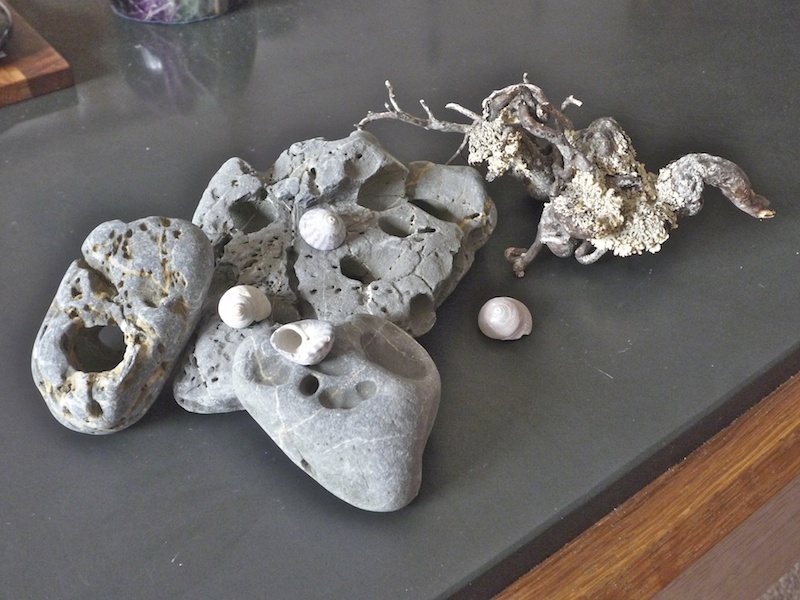 Where I live in Chichester harbour, I grew so knowing them as lucky stones! Really interesting article. I’ve lived by the sea all my life and never heard of piddocks, so I’ve learned something new today. Will soon be off to the beach to look for some! I wonder if they bore through Lewisian gneiss, though? Will have to go and have look. 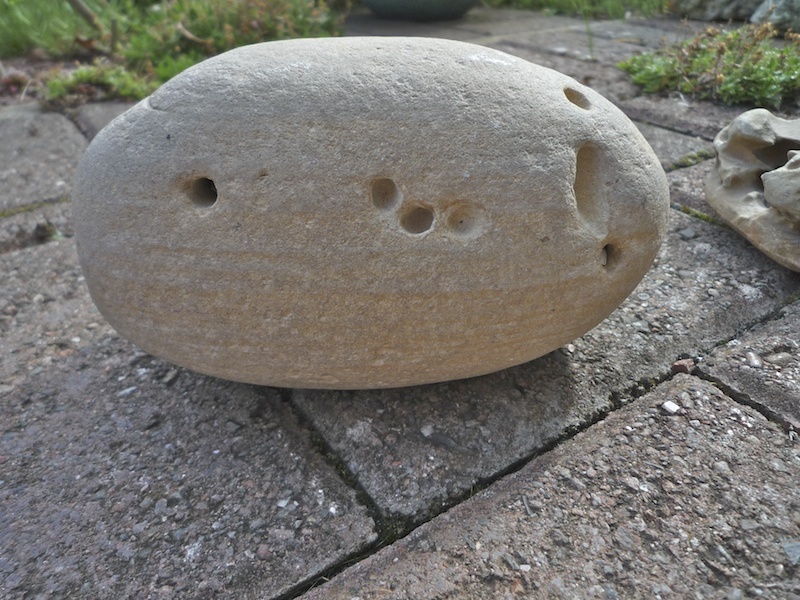 I have found a piece of sandstone with several holes made by piddocks. Some of the holes still have shells in them. The odd thing is that I found it in my vineyard near Calistoga, California. Either the San Francisco bay reached this site or it is a fresh water species? That’s very interesting! I have not heard of freshwater piddocks but I am not a scientist so maybe you would be better advised to consult the marine science department of your local University. I guess there is a chance that it was carried there, either by tidal action or human effort?! Thanks for your comment! i have found these in a creek bed in Lewis co. Ky. Thank you! Really glad you found it interesting. Wonderful to find you.. I knew that some Mollusk did the ‘drilling’, but love knowing more.. The pictures are fantastic–make me a bit envious.. Thanks for sharing and giving me something to enjoy and learn..
Had no idea therenwere such things as piddocks, though I have seen those holes. Thanks for adding to my knowledge. The photos are excellent, I think. You’re most welcome, Edith! Really glad you enjoyed reading about them. I keep finding them everywhere myself, now I know what to look for! Wonderful article. I have a collection of more than 300 holed stones including piddocks.. love them and every one has its own history.. mostly gathered in Australia but one from Scotland, one from river Thames and numerous from America.. my eyes are so tuned into holed stones I will invariably find one where ever i seek. That sounds like a fantastic collection! Truly international! 🙂 It’s strange how holed stones suddenly appear when you start looking for them. There must be some kind of magic in them, because so many people are drawn to them! There is an enormous ancient river bed her dis West aunt. billions of river washed stones and amongst them many holed stones but one must walk around doubled over to find them… some tiny some very very large. Its paradise for fossickers like myself but isolated. takes a week to get there. Sounds fantastic! Whereabouts again? Predictive text on overdrive I suspect! Tapped that LIKE button once again . . . Wish I could post a picture of mine. This is really interesting to me because I uploaded several photos of these to the Natural History Museum in London, asking what they were. A supposed ‘expert’ told they were man made !!! I always thought he was wrong, now I know better haha! Thanks! So, we have found rocks “growing” in some of these indentations– aggregations, I believe. Do you know anything about Indian paint pots, which are rocks that contain a paint-like liquid inside of them (that can also dry out into a powder). The outside of these rocks are a dull, brown, sometimes coarse and sometimes smooth. Hi Susan, I have never heard of Indian paint pots – they sound fascinating. Had a quick look online and it seems they contain iron oxide, which would give a reddish hue when mixed with water. Thanks for your comment! Very interesting. I’m a Canadian living on the East Coast of South Korea; our beach not five minutes from our university/housing is full of piddock-riddled stones, both the small grey single-holed ones suitable for making necklaces, and the larger ‘swiss cheese’ boulders, still containing the shells (just as you describe, nested inside and larger than the opening they initially drilled!) So in case no one has reported in from Asia, yup, we do have piddocks here. I use the large emptied ones for a sea-side style rock garden on my balcony, and they are beautiful. I have, I think one of these rocks. I don’t even remember where I got it. Interesting. Have three holey stones! One is drilled through it’s length like a bead with a hole through the side. And has a small remnant of shell on the inside wall of the stone. I’ll be checking over my pebble collection after reading this. Great info! 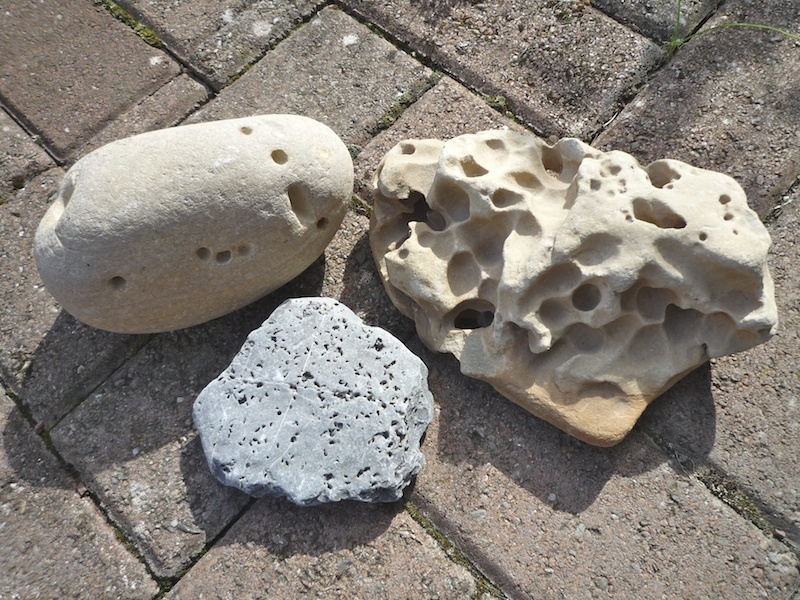 I do have several beach pebbles with holes that appear drilled. Excellent! Sounds like some evidence of piddock holes already! What I found was that, once I knew what they were, I started to find lots more. They are also called hag stones, Odin stones or holey stones, used to ser the hidden world of fairies, protection and healing. Oh that’s interesting! Thank you for that. I did know that looking through a hole in a stone was supposed to give you second sight. I hadn’t heard the other names! I found a crescent moon in a white stone on a beach in SE England on the day I buried my daughter. It was an incredible find and I have this stone 17 years!! What a lovely and touching find. I believe we come across these things because we are meant to – it’s not just coincidence. Thank you so much for sharing this. Fascinating, I have seen loads of these sometimes with the paddock inside, never knew what caused the holes or how the little fellow got in there, thank you for such an informative article, I am constantly amazed by what is all around us. So interesting, than you. Most welcome, Mary! 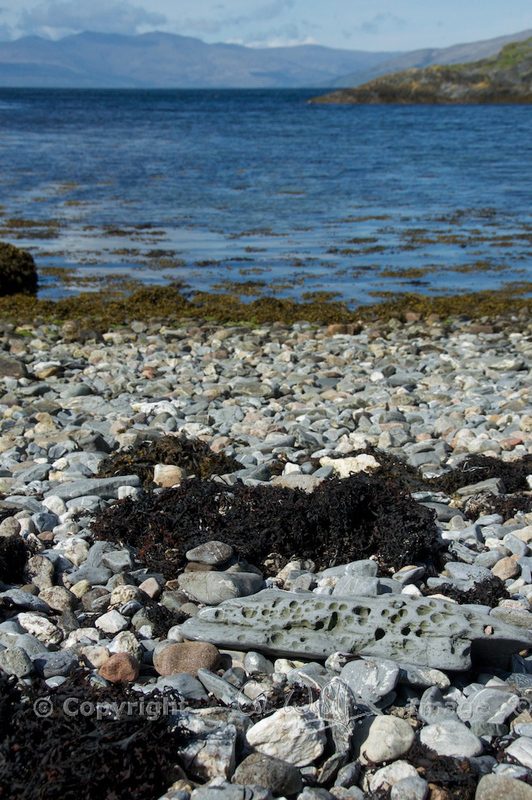 I love finding them myself, and luckily the beaches around Scotland have lots of piddock-holed stones. Really glad you found it useful, and I hope you find lots more! For the last 25 years in southwest florida(Venice,and Engelwood Florida Gilf of Mexico)in the winter I have picked stones with holes. I read (I do not remember the name of the book) in a southwest Florida nature book that some kind of a snail sits on the stones and secretes a solution of sorts which the sea and sand eventually bores a hole right through. I have found different sizes from one inch to three by four inches. They make beautiful sculptures as well as natural jewelry. Thanks for your information on all of these wonderful natural gifts on this earth. Thank you for sharing this information. So interesting. I never wondered what made those holes, which seems surprising. We considered them ‘holy’ rocks and wear small ones on a thread. Or to hold a piece of incense. So much fun to consider. That is a good idea! I love how everyone around the world seems to be drawn to these rocks. Thank you for sharing! Are there piddocks in fresh water lakes? Hi Carol, I don’t know for sure but I’m inclined to think they are marine creatures. If anyone has more definite info, they are welcome to leave a comment! Yes there are many piddocks in fresh water , I have found many in Lake Michigan north of Chicago , I always called them holey stones ,or church rocks , Wow glad to know how those holes got there . Thanks for the information . If it wasn’t – 9 degrees today I would be at the beach . Thank you for sharing that, Craig! I’m glad to know there are freshwater piddocks as well as marine ones. ‘Church rocks’ – that’s an interesting name! I agree that minus 9 sounds way too chilly to be at the beach! Fascinating…..In the past, I have tossed them. Won’t do it again. I find these in Maine in the Penobscot and Allagash rivers, far from the ocean. Amazing. Should I assume they are very old “Piddock Stones,” left over from when Maine was covered by a sea? I love the holey rocks! I never knew how the holes got there.. now I do. I love collecting shells, when I see the tourist on the beach searching for shells, I like to stop and talk about shells. I tell them the name of the shell, I can’t wait to tell someone how the holes get in the rocks….so interesting. We get a lot of piddocks here we call them angel wings. Tiny ones and big ones. They are fragile like potato chips.The bigger they are the stronger they are. I love learning about shells. I live in Galveston Island Texas. Thank you ! You’re most welcome Gloria, and it’s good to know you enjoy collecting holey rocks too! There is definitely something special about them. Thanks so much for your comment. 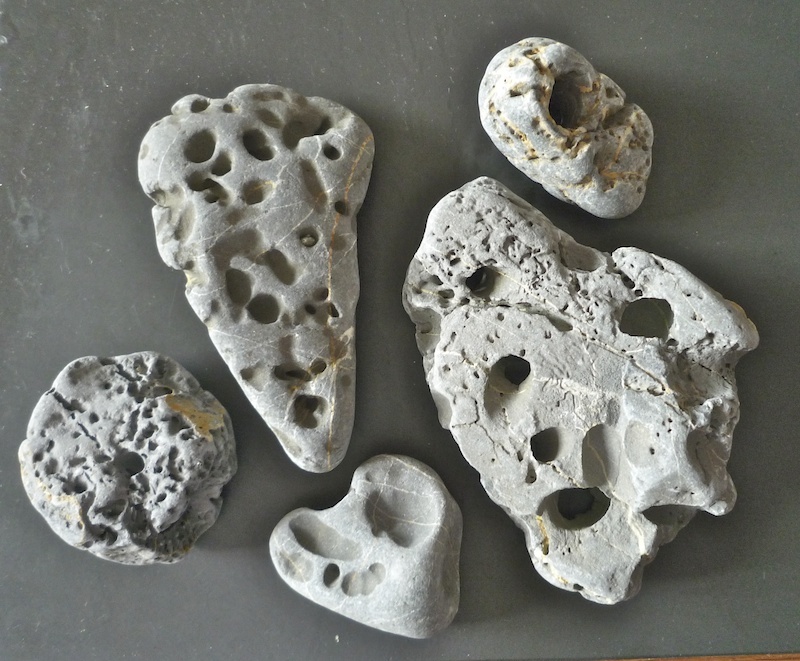 I collect rocks and stuff from south Lake Michigan – I have found these – I call them Moon Rocks but now I know what they really are….awesome! Fantastic! I love your name for them – I might use that myself! 🙂 Thanks for your comment! I never knew this!Where I live in the middle of Canada was once covered by an inland sea 80 million years ago.I have picked up alot of rocks much like you have pictured and never considered it the handy work of a creature rather than erosion or quirk of formation.Now I’ll have to think about which is which. Wow, that’s interesting! I’ve not heard of paddock relics that old but I can quite see how it’s possible! Let me know if you come to any conclusions! There are many of these holey stones on the East Coast of England . I collect them and didn’t know how they were formed- I assumed from erosion. Thank you for the interesting information. Glad that this was of interest! Plenty here on the west coast too, and I still love finding them even though I have lots already!